It has been more than 30 years since the last major overhaul of the U.S. federal tax code – the Tax Reform Act of 1986 – and many lawmakers are getting restless. Over the past few years, several members of Congress have drafted original proposals for reforming the U.S. tax code, ranging from six-page white papers to 980-page bills. These plans reflect a widespread, bipartisan consensus that the U.S. tax system is overly complex, inefficient, and uncompetitive. While none of the proposals is likely to become federal law any time soon, their importance should not be understated. For instance, the Tax Reform Act of 1986 was crafted out of several detailed tax reform plans that had been circulating through Congress, beginning in 1982. To help policymakers and voters compare these plans, we’ve developed an interactive tool that summarizes the major provisions in each proposal. 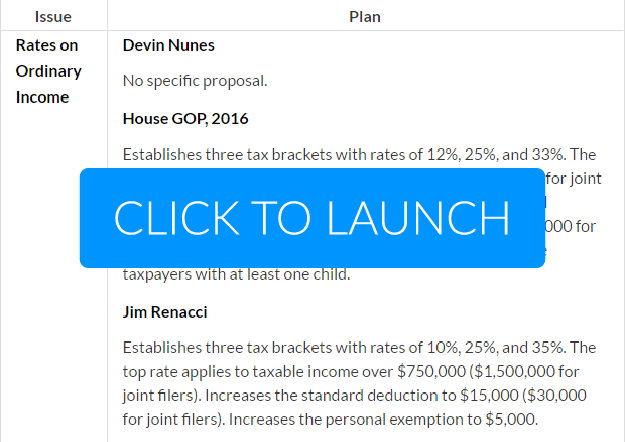 Select up to five Congressional tax proposals and see how they approach different issues relating to tax policy. Rates on Ordinary Income: There are currently seven tax brackets for ordinary income earned by individuals, at rates of 10%, 15%, 25%, 28%, 33%, 35%, and 39.6%. Adjusting these brackets and rates is one way to increase or decrease the individual income tax burden on different segments of the population. Itemized Deductions: The tax code contains dozens of itemized deductions that households can apply to lower their taxable income. These deductions range from the mortgage interest deduction to the deduction for state and local tax payments. Itemized deductions are often cited as a source of complexity in the tax code. Credits: While deductions lower a household’s taxable income, credits lower its overall tax burden. Among the dozens of credits in the tax code, the Earned Income Tax Credit and the Child Tax Credit are two of the most well-known. Many tax credits are designed to benefit low-income Americans. 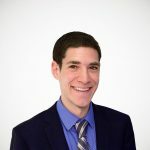 Alternative Minimum Tax: The alternative minimum tax was enacted in 1982, to increase the tax burden of households that make extensive use of tax deductions and credits. It is usually considered one of the most complex portions of the individual tax code. Rates on Capital Gains and Dividends: Income from capital gains and dividends is taxed at lower rates than other income, with a top rate of 23.8%. Some see these rates as preferential treatment for the wealthy, while others see them as a measure to prevent the double taxation of investment income. Corporate Income Tax Rate: Corporations also pay income taxes, at rates up to 35%. Although the U.S. corporate income tax rate is the highest in the industrialized world, corporate taxes make up a relatively small share of federal revenue. Treatment of Capital Investment: Businesses that invest in new capital (such as machines, buildings, or equipment) are not able to deduct these costs as they occur. Instead, they are required to spread out the deductions over time. The length of time a business needs to write off investment has a significant impact on its cost. In recent years, Congress has temporarily allowed businesses to deduct, or “expense,” 50% of investment costs in the year they occur. Some have called for this provision to expire, while others have called for it to be expanded, to allow businesses to fully expense all capital investments. Treatment of International Income: The United States is one of the few countries with a worldwide tax system, where businesses pay taxes on income earned overseas. However, businesses are often able to defer paying taxes on international income, until they return the income to the United States. Most other countries have “territorial” tax systems, in which corporations’ foreign income is exempt from domestic taxation. Treatment of Pass-through Business Income: The majority of American businesses are not subject to the corporate income tax. Businesses such as partnerships, sole proprietorships, and S corporations now account for more than half of all business income and employ more than half of the private sector workforce. These entities are known as pass-through businesses, because their profits are passed directly to the businesses’ owners and are taxed on the owners’ individual income tax returns, not through the corporate income tax. Payroll Taxes: In addition to income taxes, individuals face two payroll taxes, which are taken directly from paychecks and are used to partially fund Social Security and Medicare. The Social Security payroll tax only applies to the first $118,500 of wages, while the Medicare payroll tax applies to all wages. These taxes comprise a significant portion of most Americans’ tax bills. Estate Tax: The estate tax is levied on the net value of property owned by deceased persons on the date of their death. Currently, estates are taxed a rate of 40% on assets over $5 million. As a result, the estate tax raises relatively little revenue and is difficult to collect. Other Taxes: This category includes major aspects of the tax code that don’t fit neatly into the other eleven categories, as well as any new taxes that candidates propose (such as value-added taxes). We hope to update this table as more members of Congress offer comprehensive tax reform proposals in the upcoming months and years. If you have any thoughts about how to improve this table, shoot us an email at greenberg@taxfoundation.org. (To see a similar chart, comparing the tax reform plans offered by the 2016 presidential candidates, click here).